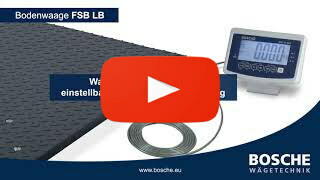 Product information "Floor scale FSB LB"
On-floor installation: Suitable for companies that use forklift trucks. A base frame set is compulsory for verified scales in accordance with the Weights and Measures Act.On-floor installation with ramps: Suitable for companies that use pallet trucks. You can use one ramp for access on to the scales or two for access on and off the other side.In-floor installation: Suitable for companies that use both forklift trucks and pallet trucks. With this installation option, the scales platform is installed in the floor using a pit frame. A drawing can be supplied for these pit scales. The platforms are fitted with four high-quality DMS load cells K30S. The indicator BWI with large 50 mm display is responsible for the clear weight identification and summing the weighing results. The tare is executable over the entire measurement range. Related links to "Floor scale FSB LB"
The BWI is a favorable indicator, which is suitable for simple weighing applications. The display is a robust, user-friendly device, its functions are easy and quick to understand. The indicator provides simple operation with a minimum of buttons to be pressed. By default, the indicator is powered via an AC adapter (100-240V/50-60Hz) or the internal battery. The optional 1.3 Ah battery pack provides with up to 30 hours of mains-free operation, absolute mobility, in which the device for stationary use can easy operate in network operation. The plug-in mains adapter is included as standard in delivery. The optional RS 232 interface allows a bidirectional data transfer of weight data to a PC, printer or remote display. Transmission cable, external second display (suitable for sale to the public) or printers are available as accessories.